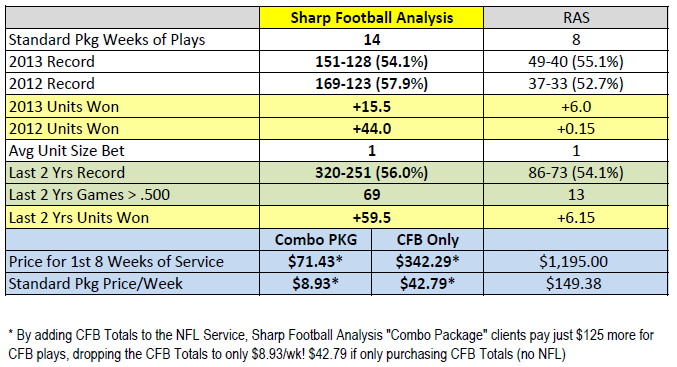 2014 College Football Totals – 57% lifetime, +85.1 units… For only $8.93/week? Pay in Feb 2015? Sharp Football Analysis welcomes you to the 2014 College Football Season. Which marks the 4rd season of my college football totals, and the track record the past 3 years is nothing short of phenomenal. For the absolute #1 value in College Football Totals, from both a win perspective and price point, SUBSCRIBE NOW to catch early bird savings, offer ends Thursday (8/21)! 1. Get the Combo Package! It stacks CFB totals on top of all NFL play for just $125 more! That’s LESS THAN $10/week! And PAY NOTHING NOW, you don’t pay until AFTER the 2015 Super Bowl! 2. Get the CFB totals standalone package. Like #1, PAY NOTHING NOW, nothing until Feb 2015! That’s right, I’m STILL charging less than $10/week to add these OUTSTANDING CFB totals to your NFL package, the EXACT same price I charged in 2013. My CFB Totals are used by major players in the industry and we’ve seen significant line movement on these totals after release. To read more about Market Influence, moving lines and beating the closing number last season, CLICK HERE. To purchase the 2013 College Football Totals, SUBSCRIBE TODAY! Checkout with Bill Me Later at Paypal to pay NOTHING until Feb 2015! Do it by 8/21 to catch $100 MORE in savings. Analyzing NFL Preseason Scoring: Are More Points Being Scored? You can’t watch a preseason game without visually and audibly noticing the increased number of flags. Anytime one flies, the announcers harp on it as well. Most people seem hate it, others don’t care. Personally, I’m tired of officials using too much discretion in what they call. They have 1 set of criteria for the preseason (extra tight), then 1 set in the regular season (a bit looser) and then 1 set in the playoffs (very loose, few flags). I’d rather see all penalties accurately called, and if rules need changed to get the right mix in place, change the rules. Thru 2 weeks, we are seeing more ppg than we saw in 2012 or 2013, however, that is solely because we’ve had multiple “outlier” games with ridiculous scoring. What we are NOT seeing are “overs” hit. Thru 2 weeks, only 42% of preseason totals went “over”, as compared to 60% and 56% the prior 2 preseasons. The reason we’re seeing more ppg on average is because we’ve had 7 games with 55+ points scored. If you COMBINE the prior 2 preseasons, you don’t see 7 games TOTAL hit that ppg level in the first 2 weeks. As such, we’re actually seeing the vast majority of games have FEWER points than in the past couple of seasons. But boosting the average are several outlier games with well over 55+ being scored (80, 77, etc). The real test will be Week 3, starting Thursday, when starters play into the 3rd quarter. 2013 week 3 games saw avg total of 42.5, avg ppg of 45, 9 overs & 7 unders. 2012 week 3 games saw avg total of 41.5, avg ppg of 45.5, 9 overs & 7 unders. Currently the week 3 games which begin on Thursday are lined with an avg 44.3 total, well above anything we’ve seen the past couple of seasons.